Is your patio seating losing it's comfort? Do you have holes in your cushions due to squirrels or other rodents? 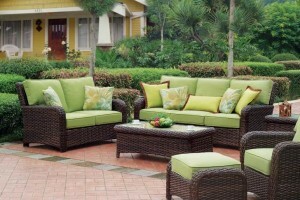 We can make new custom-made cushions for your outdoor pieces. Choose from either exterior dacron or dri-fast foam for the inserts and select from over 200+ Sunbrella® fabrics. Give your outdoor space a whole new look this season. NOTE: Loveseat/swing/glider/sofa (long) cushions equal 2 or 3 standard cushions. Additional cost to glue-up cores larger than 26″ or 27″ wide cores.